Well we made it out for a december key largo fishing trip today. Ran down to the flamingo area fishing for a half day trip. Caught the end of the rising tide and just about slack current. Lucky for us there was enough water to get up near some shallow water shore areas around some islands. 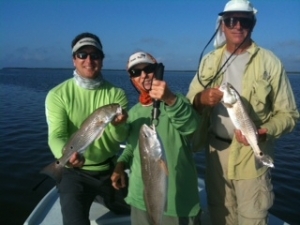 We caught plenty of redfish, about 2 dozen in total between my 3 anglers. They were biting on shrimp and jigs, several nice slot size fish mixed in with some little puppy drum. The key largo fishing in december should be getting better and better as we’ve had tremendous weather, though I must admit a cold front would be nice to chill things out a bit. These mid-80 degree days feel a little too much like summer especially when there is no wind like today! That’s ok though the fish didn’t mind. After we got done catching reds we moved on out before the water got too low and caught some mangrove snappers around other islands for dinner. Got our limit in about 45 minutes and headed on home. The boys had me filet the fish up for lunch/dinner and they let me know they loved it! It’s tough to beat fresh caught mangrove snapper! That’s all for this key largo fishing report, until next time! This entry was posted in Fishing Reports and tagged december, mangrove snapper, redfish. Bookmark the permalink.